SoupyTM~A dry cured, dense, and flavorful salami. We use a fine grind of pepper, very lean pork and a slightly different drying process than its sister sausage, the traditional soppressata. Fortuna's Soupy® is an old world tradition that was brought here from Italy over a hundred of years ago and was passed down from generation to generation, originating in Calabria, Italy. Like many other fine arts it is a dying tradition. 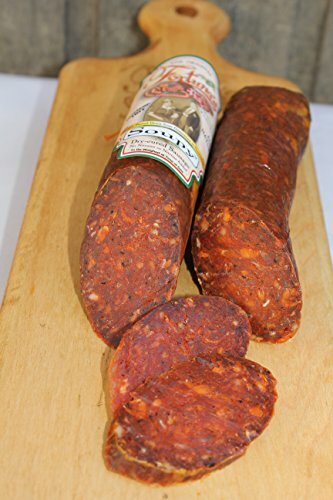 At Fortuna's we have taken our old family recipe and resurrected the fine art of making dry-cured sausages and salami. This salami is in the middle of the road in the hotness level; our hottest is "Nuclear" hot. 10oz Stick-Heat level is "HOT"
If you have any questions about this product by Fortuna's, contact us by completing and submitting the form below. If you are looking for a specif part number, please include it with your message. SEABENEFIT Barbed Star - Wild Caught Sea Cucumber Dried All Natural Nutritious - 8 oz.